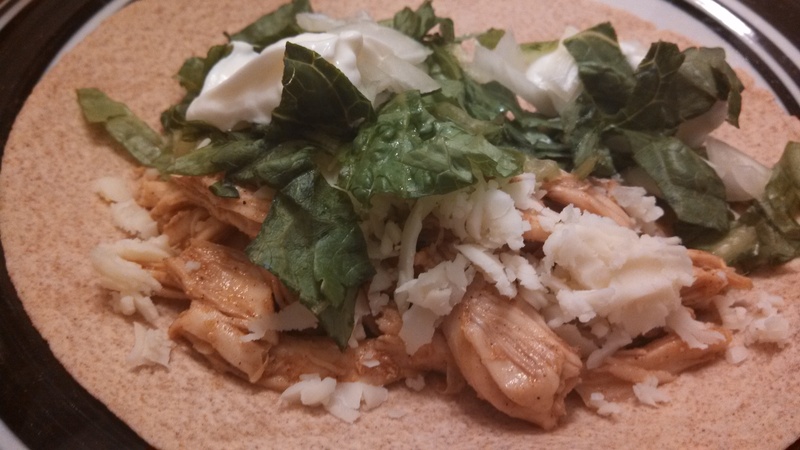 The other night I made these honey lime chicken tacos by Six Sisters’ Stuff (I love that blog, FYI). The original recipe is simply called lime chicken tacos, but that is kind of misleading, because this has a very blatant honey flavor. This is such an easy dish, and if you pre-cooked the chicken, it can be ready and on the table in only the time it takes to marinade the chicken! I, however, did *not* pre-cook the chicken, so it took quite a bit longer – I cooked two chicken breasts on 350 for about 25mins, waited for it to cool (but I only waited, like, a minute, and then proceeded to burn my fingers trying to shred them). The other nice and quick thing is that it has a short ingredient list, and most of the ingredients are “pantry staples” anyway. Well, at least in my pantry. Additionally, I had to get a little creative, as I realized I did not have enough lime juice. I stood in front of my fridge, scanning every item to see what I could use to get the same zesty feel that lime juice has. Then I spotted our bottle of Key West key lime juice (left over from when I made my husband’s favourite key lime pie). It supposedly has a sweet edge, but when I taste-tested it, it was pretty tart, so I used a tablespoon of that. Problem solved. Then I realized I only had a teeny sprinkle’s-worth of cheddar cheese, so I took our pre-sliced provolone and shredded it. I’m so innovative, I know. 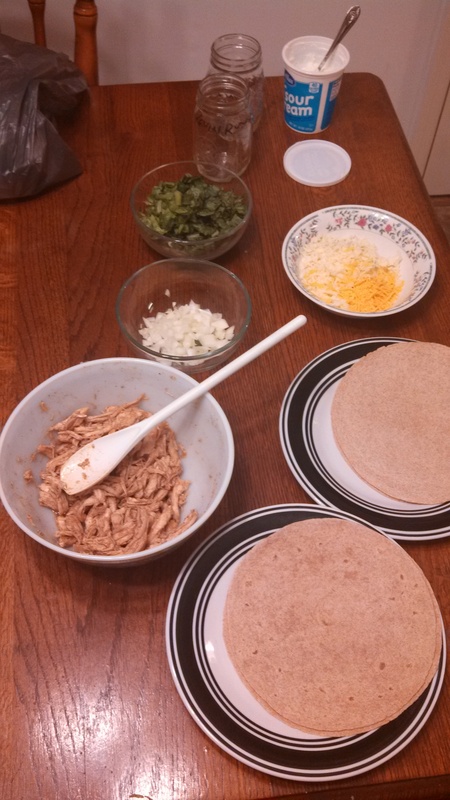 😉 Oh, and I used whole wheat soft tortillas instead of hard taco shells. -Whisk together the honey, lime juice, chili powder and garlic powder to make it into a sauce. 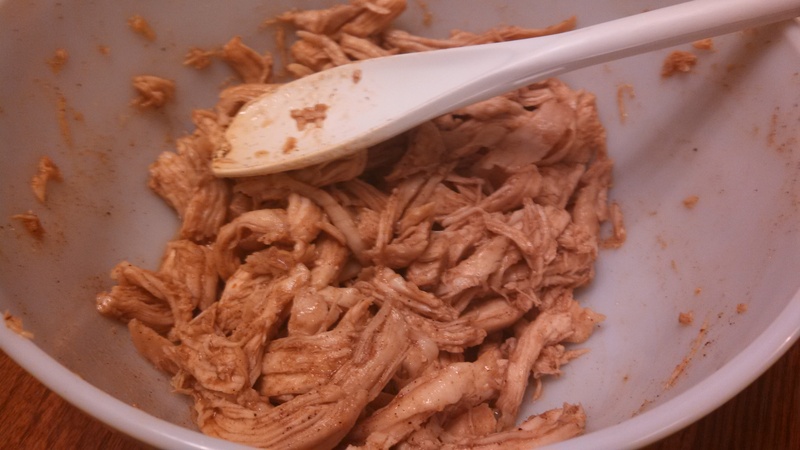 -Place the shredded chicken in a ziploc bag and pour the sauce in with the chicken and shake until it is all covered (I don’t have the gallon-sized bags, so I just mixed the shredded chicken into a big bowl with the sauce, then stirred several times to make sure it was fully saturated). -Stick the bag with the chicken in the fridge for 15 to 30 minutes to let the sauce soak in (stir often, if you have it in a bowl, to make sure it remains saturated). -While it is soaking, chop and/or prepare your toppings.